Ingolstadt - After taking the lead early on, Hertha Berlin withstood a relentless effort from FC Ingolstadt to record a 1-0 victory at the Audi Sportpark. The game started quietly, with Ingolstadt setting the tone and coming close with a Marvin Matip header. Hertha burst into life in the 11th minute, though, Mitchell Weiser exploiting a poor clearance from Markus Suttner and scoring with Hertha's first shot. Ingolstadt responded well and kept applying pressure, but were caught by some smart counter-attacking from the Berliners; Darida came close with 22 minutes gone, while Salomon Kalou's header brushed the side netting on the half-hour mark. The hosts tried to muster a response, but the Hertha defence was solid enough to prevent more than a handful of hopeful shots. Both sides looked keen to get forward after the break, with Ingolstadt able to create a couple of half chances on the counter attack. Die Schanzer began to create ever more opportunities as the second half developed, the best coming from Mathew Leckie and Romain Bregerie, both of whom struck the ball wide. The pressure continued to build, and ex-Hertha man Thomas Pekhart headed just inches wide on 70 minutes, before Leckie saw another shot drift wide. Ingolstadt came achingly close in the dying minutes, Rune Jarstein saving Pascal Groß's palm-stinging shot, but the Old Lady held on to move up to fifth in the table. Vladimir Darida was imperious at the heart of the Hertha midfield. He was the glue that held together an impressively compact unit, which prevented Ingolstadt breaking through for the best part of the game. 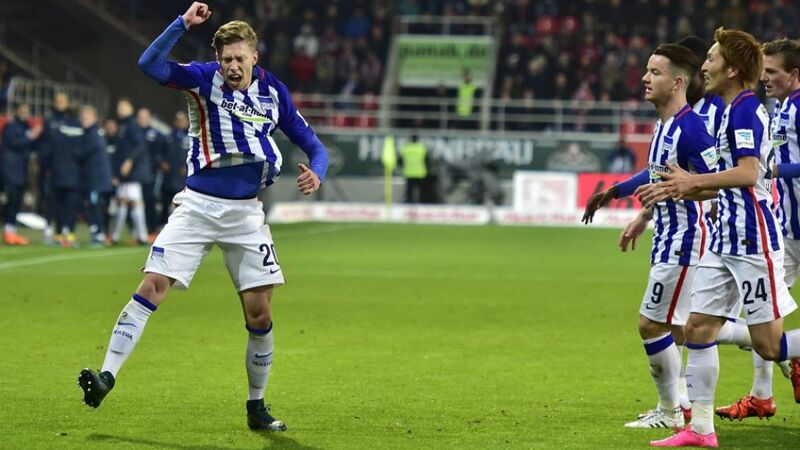 After going down to a last-gasp Max Meyer goal on Matchday 10, Hertha showed their resolve to record their fifth league victory of the season at the Audi Sportpark. Pal Dardai's side now have 17 points, just one fewer than they had after 19 matches last season. The Hungarian's no-nonsense approach is beginning to pay off. Hertha have now scored three times in the opening 15 minutes of this season.Ingolstadt had 18 shots to Hertha's 5.Both teams committed 11 fouls each.